Last month I attended a seminar in Victoria by the trainer, Brian Willis. Brian’s presentation was entitled Harnessing the Winning Mind and Warrior Spirit. The intended audience for this particular seminar was police officers, peace officers and military personnel. I am, of course, none of these. As a writer, the chance of me getting into a gunfight any time soon is slim. Interestingly, however, I was the one taking the most notes during the seminar – eighteen pages, to be precise. For a writer, the nuggets of wisdom gleaned were pure gold. And I’ve attended Brian’s seminars multiple times over the years. But every time I hear him speak, I not only learn new things, I’m also reminded of ideas I’ve already learned but have forgotten. During last month’s presentation, one new component that Brian has implemented into his seminar, since I last heard him speak, was a clip from the John Petropoulos Memorial Fund’s (JPMF) Put Yourself in Our Boots safety video: “The Story of John” part. Just in case you’re a reader who doesn’t know my background, I was married to John, who was a police officer who died in the line of duty in 2000. John died from brain injuries sustained after a preventable fall at an unsafe workplace, while investigating a suspected break and enter. There was no safety railing in place to warn him of the danger. After Brian showed the clip from the Boots video, he went on to explain to the group what the JPMF does in terms of raising public awareness about workplace safety issues facing emergency responders – and why our safety messages matter. So there’s me, in the back row, madly scribbling all this down. I’m the Board Chair of the JPMF, for God’s Sakes – I’m supposed to know this stuff like the back of my hand! And I do – but hearing someone outside the JPMF articulate it, in such a powerful and succinct way, was extremely insightful. 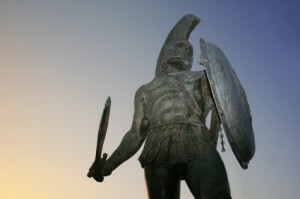 Spartans excuse without penalty the warrior who loses his helmet or breastplate in battle, but punish with loss of citizenship rights the man who discards his shield. A warrior carries a helmet and breastplate for his own protection – but his shield is for the protection of the whole line. Clunk…another truth hit home for the writer in the back row. This is exactly what the police officers who started the John Petropoulos Memorial Fund did (and still do today, along with many other people): they chose to protect the line. For to them, to have let John’s preventable death go unaddressed would have been akin to discarding their shields – because what happened to John could happen to any police officer. And then I thought further: what is a police badge but a smaller version of a shield? And how did those police officers start the JPMF? They had memorial pins made that had John’s badge/regimental number on them – and then sold the pins to other officers, friends and family. Today, the JPMF is a charitable organization that educates people about how and why to make workplaces and roads safer, so as to help ensure emergency responders make it home safely to their families after every shift. In other words, the JPMF is like a modern-day shield that serves to help protect the line of police officers, firefighters, peace officers, paramedics, etc, so they can do their job. Maryanne Pope is the Board Chair of the John Petropoulos Memorial Fund and the author of A Widow’s Awakening. Great stuff, MA. Loved the blog post. I too have been having my own “clunk” moments when something becomes clearer for me. And I wonder how many clunk moments I have missed along the way.